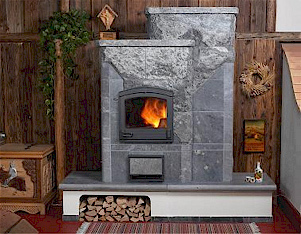 Masonry Heater Store, LLC is pleased to be an authorized dealer for Tulikivi brand soapstone masonry heaters, ovens, and cookstoves. 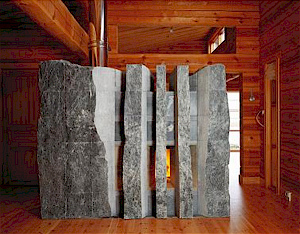 Tulikivi, a company based in Finland, is the world's largest manufacturer of heat retaining fireplaces. With distributors and dealers all over Europe and North America, Tulikivi has produced more than 200,000 masonry heaters. "Tulikivi", translated from Finnish, literally means "fire stone". This is an apt name since every Tulikivi is made of high quality soapstone quarried in Finland. 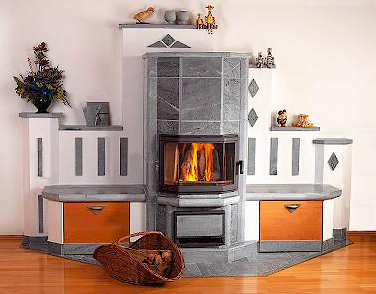 Soapstone is unique in the world of masonry because of its natural refractory, heat storage, and heat transfer aspects. It is naturally able to withstand the high combustion temperatures inside a masonry heater. Thus even the firebox and other inside portions of a Tulikivi are solid soapstone. This unique natural stone stores 10-20% more heat than any other masonry material and transfers heat about six times faster. This means that the heat of a fire gets absorbed faster, gets into your living space faster, and lasts longer than it would with a heater built of any other stone or brick. What's more, soapstone has a luxurious feel and color. Polished soapstone has a silky smooth feel, a result of the natural talc content of the material. It's coloring is typically bluish grey to silver grey. Because it is a natural product, every piece is unique with outstanding marble-like grain patterns on many pieces. Tulikivi also offers accent stones in a deep green serpentine, silvery Kianta sky and Kianta Blue. In addition to the finely polished pieces, every Tulikivi can also be built with the addition of rough faced, split soapstone, which we call rockface stone. This allows you to choose between the clean straight lines of polished stone or the more rustic and natural look given by the rockface. Tulikivi creates masonry stoves of many sizes and shapes. There are heaters designed to heat just a few hundred square feet and heaters designed to heat all of your primary living space. There are some that are meant to be room dividers and others meant to fit into a corner. Many can have the chimney exit the top of the fireplace while most were originally designed to have the flue exit at the base. Most of these are shown in our online 60 Page Brochure. We are also happy to mail you a catalog at no charge! Yet, you may not find just what you want in the pages of a catalog. Fortunately, any Tulikivi model can be modified to suit your desires. Add a mantel of a special shape. Or add a carved stone above a mantel. Perhaps you would like a bench, or shelves, or wood storage, or. . . . Dare to dream. We are happy to assist you in designing a custom Tulikivi that is perfect for your tastes and home.